Disclaimer: This post is sponsored by VELVEETA®. All opinions are my own. Cheesy nirvana on top of a grilled pizza crust! 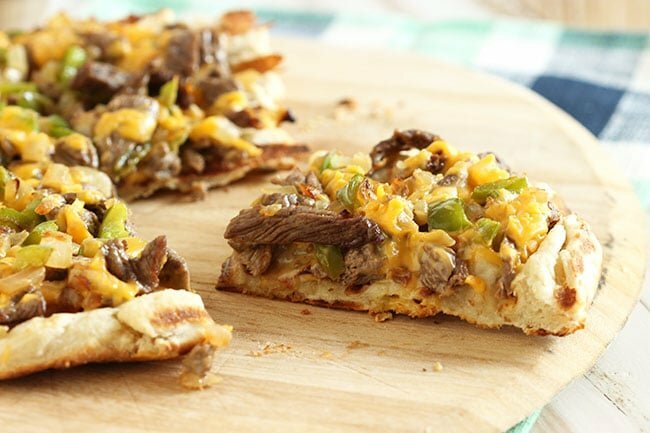 Grilled Philly Cheesesteak Pizza has all the makings of the classic Philly cheesesteak but made just for summer by grilling the entire thing right on the grill rack. Crispy and incredibly amazing. Just in case you were wondering which ‘burb I reside in…the secret’s out. I’m a Philly ‘burbs girl all the way. Born here…moved for a bit…back with a vengeance, I love everything about my town and the city I live near. Philadelphia is my home and it’s a short drive away. The Liberty Bell, Independence Hall, insanely spectacular restaurants and cheesesteaks. The cheesesteaks are killer. Using as few ingredients as possible, I wanted to get as close to a true Philly cheesesteak as I could so I used a very thinly sliced rib-eye steak. You can get your butcher to slice is thin like a chip steak or you can put it in the freezer for 15 minutes and slice it yourself. 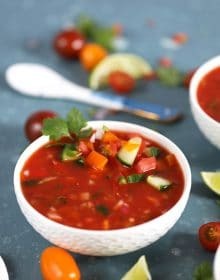 The freezer method firms it up perfectly making it easier to slice thinly against the grain (against the grain is important to avoid chewy meat.) I sautéed some finely diced onions and a bit of green pepper. Just five ingredients (and a few staples) for this beauty. 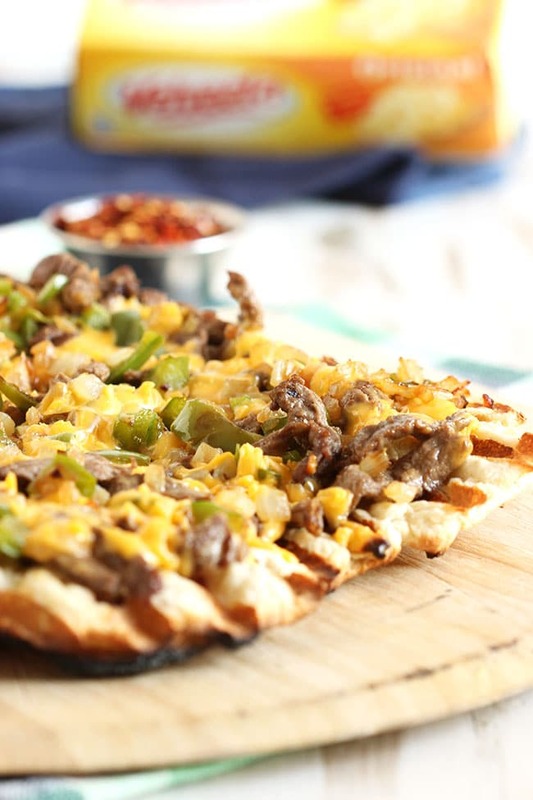 Now, cheesesteak purists…I know green peppers are a big no-no…but really, we’re making a pizza here and they are amazing in this recipe so let’s just go with it. Shall we? I topped my pizza with some shredded VELVEETA® because it melts so beautifully creating that Liquid Gold topping we all know and love in our cheesesteaks. It was the perfect match for the onions, steak and peppers. 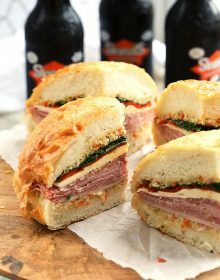 And that crust….it’s the best delivery system for getting it into your mouth as quickly as possible. You can share if you want….if you’re nice like that. 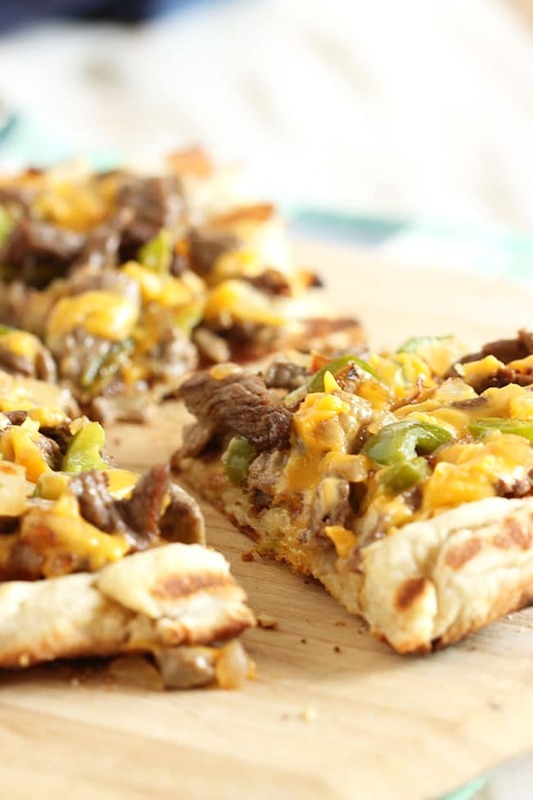 Change up your basic pizza night with this Grilled Philly Cheesesteak Pizza! Divide the pizza dough in half and roll out to 1/4 inch thickness. Lightly brush both crusts with 1/2 a tablespoon olive oil each. Set aside. 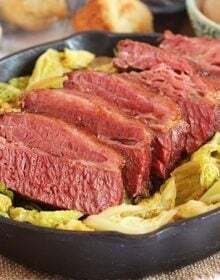 In a medium saute pan, brown the steak until no longer pink. Transfer to a paper towel lined plate and keep warm. Pour off the fat in the pan and add 1 tablespoon olive oil. Return the pan to the heat, add the onions and peppers cooking until softened. Season to taste with salt and pepper. Add the steak back to the pan and remove from the heat. Toss to combine. Place the dough directly on the grill grates oil sides down. 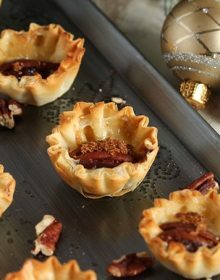 Turn the heat to low and brush the tops with the remaining oil. Cook until the dough starts to puff up and is easy to remove from the grill. Using a spatula, flip the dough over and top with the steak mixture. Sprinkle the Velveeta over the pizza and close the grill. 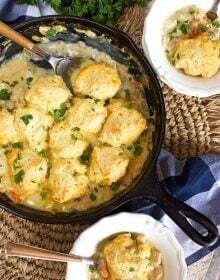 Cook for 2-3 minutes or until the Velveeta is melted. Transfer to a serving platter, slice and serve immediately. I never heard of Velveeta on a pizza. Your truly made a Grilled Philly Cheesesteak Pizza! I’m so glad you used thin sliced rib eye!! Wow, this sounds amazing! Love it! Philly pizza? Oh, heck yes!! Philly cheesesteaks are one of my favorite treats! I haven’t had one in forever. And in pizza form?! Yum! I just love that you don’t need a fancy pizza oven to make pizza in the summer, just a grill! Delicious! 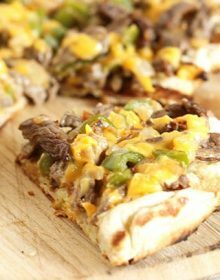 We have a local place that makes an incredible Philly cheese steak pizza, but they won’t share their recipe! Ha – got one now! I have never been to Philly, so can’t claim that I’ve tasted an authentic Philly cheesesteak. That needs to change! In the meantime, I’ll start with this pizza…salivating over it. I really enjoyed my one visit (so far) to Philly and love cheessteak sandwiches. What a fantastic idea to make it a pizza. Yum! I’m totally drooling! 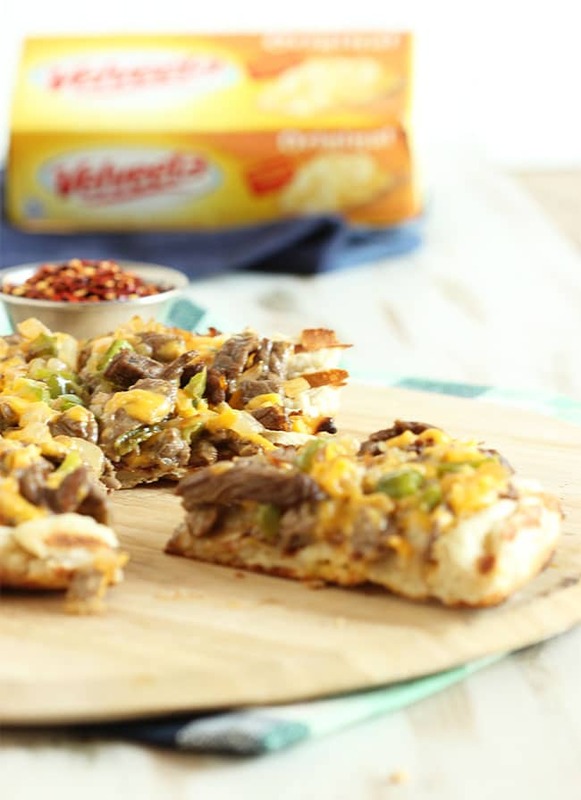 I love Velveeta – especially on pizza!